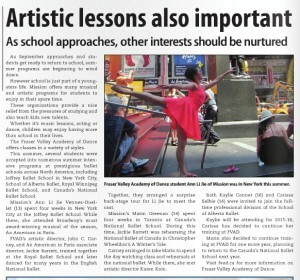 The importance of artistic lessons appears in the Mission Record today, with an article depicting our summer activities. The article is titled “Artistic Lessons Also Important” and includes a photo of FVAD Pre-Professional student Ann Li Jie appeared with the articles. Ann Li Jie attended Joffrey Ballet School in New York City this summer.